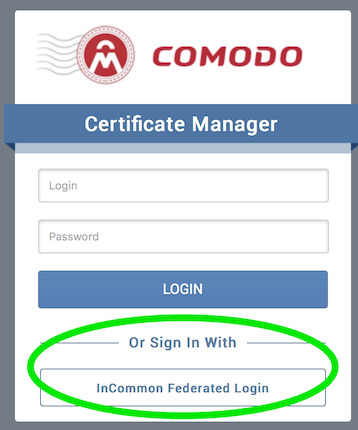 Information on this page will help you get started using the InCommon SSL certificate self-service interface offered to IT Pros by Technology Services. To log in to the web interface, visit: http://go.illinois.edu/comodo. Choose to sign in with "InCommon Federated Login." Note: If you do not yet have a login, please visit http://go.illinois.edu/sslsignup to obtain a login to the self-service system. 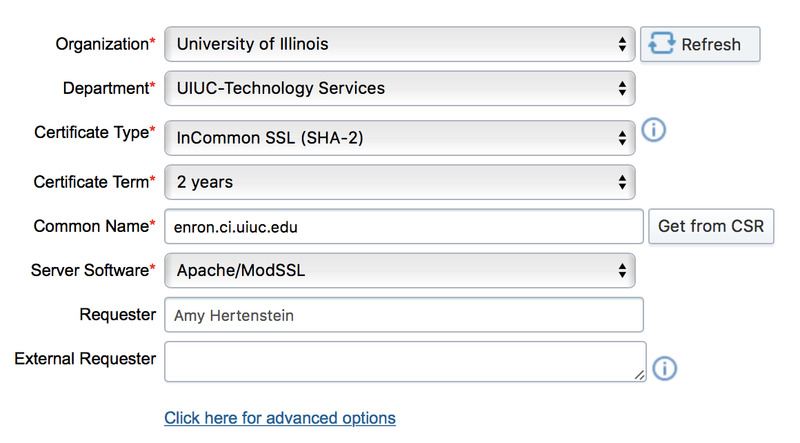 Choose your campus, then continue to log in via Shibboleth with your UIUC AD credentials. The navigation bar at the top of the screen contains the main areas of the interface. The "Dashboard" is loaded by default. Select "Certificates" to add/change your certificates, or "Settings" to add or see the domains you are authorized to request certificates for. If you do not see the domain that you need, you can click on the "Domains" sub-tab and then "Delegations" to add one. Contact certmgr@illinois.edu to get the new domain approved by an admin. Make sure that "Manual creation of CSR" is selected, then click "Next" in the lower right-hand corner. Paste in your CSR. Be sure that your CSR is at least 2048-bits and that you have access to the FQDN that the CSR is for (see note above). Click "Next" in the lower right-hand corner. Choose "University of Illinois", your department name, the type of certificate that you want, the desired term and the server software you are using from the drop-down boxes. The common name will auto-populate based on what is in your CSR. Click "Next" in the lower right-hand corner. Then choose your auto-renewal preference and click "OK". 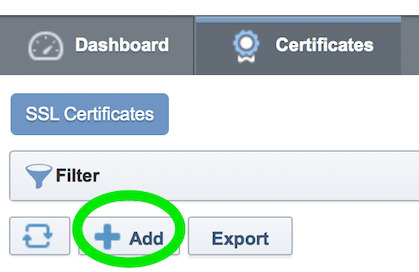 Your certificate will then appear in the certificate list with a status of "Requested". Click on the radio button next to it and then click "Approve". Enter any notes that you like, and then click "OK". InCommon maintains a complete set of documentation on all the features available in the web interface as well as best practices on their website at https://www.incommon.org/certificates/repository/index.html.